Today I am excited to introduce you to one of the best teachers I have ever come across on the web. His name is Desi Serna, a professional guitar teacher and author of Fretboard Theory, from Guitar-Music-Theory.com. I first got introduced to Desi through his wonderful and highly informative free podcasts on iTunes. Please note: Desi's free podcasts are not for beginners. They are more suited for intermediate and advanced players who are trying to learn more about guitar music theory. In order to truly benefit from Desi's material, you should already know major, minor and seventh chords, common barre chords or power chords and have experience playing basic melodies or riffs. Also, you should have lots of experience playing songs. If you meet this criteria, then I think Desi's approach is an awesome way to rapidly improve your guitar theory knowledge. He knows his stuff and can teach too (often a rare combination)! Desi's Fretboard Theory DVD's are extremely well done and cover topics such as tips and tricks for learning the notes on the guitar fretboard, chord progressions, the CAGED system, pentatonic and major scales as well as more advanced topics such as intervals and guitar modes. Desi's teaching style is terrific in that he breaks down the fundamentals of guitar theory in a way that is easily understood. 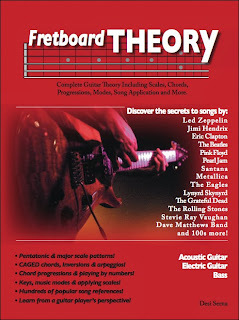 In the past, I have come across guitar theory books, but often found them difficult to follow and put into practice. With Desi's audio, video, and written material, as well as the forum on his website, there are so many helpful tips and tricks to turn you into a better player. I have been studying his material for more than a year now, it has definitely taken my playing to a new level. Desi sells a book and DVD series that can be purchased instantly through the web or sent by mail to you. I was so impressed with his teaching methods that I purchased and downloaded all of his material (161 page e-book and over 9 hours of DVD instruction!). They have been so helpful for me in becoming a better player. If you are an intermediate or advanced player and serious about improving your guitar skills, I highly encourage you to explore his material and see if Desi's teaching style works for you. * Note: All of Desi's material come with a Money-back guarantee and free e-mail support with all orders. Disclosure: Please note that I use an Amazon.com affiliate link to and I will earn a commission if you purchase Desi's material through my link (at no extra cost to you). I have experience with his offerings and I'm recommending them because they have definitely helped me to become a better guitar player. I believe it's best to only purchase a product if it can help you with a goal you are trying to achieve, so my advice is to start with the free podcasts. If you decide to purchase Desi's material I would really appreciate it if you can click through this affiliate link. What are your thoughts on Desi Serna and Fretboard Theory? Has his material helped you to become a better player? Please leave a comment below to help share your feedback with other readers.